Series 1 of 12 How did Garnet become January's birth stone? 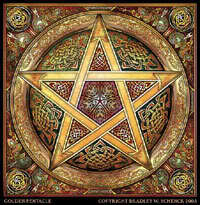 WiccanWay » Lessons » Series 1 of 12 How did Garnet become January's birth stone? Pomegranate seeds... what? Yes, that's it exactly. Garnet resembles Pomegranate Seeds, and one look at them nestled inside a Pomegranate with their varying hues of red definitely confirms this. Garnet, or rather the Latin word Granatus, that is, means grain or seed. Thus the name was given to the Garnet as the stone resembles the seeds within. It is said that Noah hung a Garnet from the front of the arc to light its way during the Great Flood. It is also said that Hades gave Garnets in the form of Pomegranate seeds to Persephone, attempting to ensure she would return to the Underworld after He set Her free. The fact is that Garnets were first mined in Sri Lanka over 2,500 years ago, and may now be found virtually around the world. In the United States they can be found right here in Arizona. What's most interesting about this stone is that the stone is generally accepted as being a red stone. And while it's most commonly found in red, yellow, orange, green, pink, violet, all these colors and more can be listed among the found sources of Garnets. The array of colors is due to the mineral and chemical makeup of the stone itself such as iron, calcium, and manganese; and jewelry made with Garnets can be dated back, according to some internet sources, to the late Bronze age. Today, garnets' most common industrial use is in some sandpapers, because of its moh's hardness of 6.5 to 7.5. The Garnet is the stone for those going on safari, or on a journey. And, as we begin the journey through the year, we find Garnets to light our path, and to guarantee our return next year. Giving a Garnet laden jewelry peice to a loved one conveys the message of a safe journey, and a speedy homecoming. Please check out our Garnet birthstone jewelry at http://www.etsy.com/shop/themodernmythos. In our next blog, we'll talk about February's birth stone, Amethyst. Please keep an eye out for the blog, and as always, we hope you'll allow our craft, to inspire yours.